The man accused of ploughing a rented truck through a crowd of cyclists and pedestrians near the site of the 9/11 attack has been identified as an Uzbek who lived in New Jersey and drove for Uber. Sayfullo Saipov, 29, was shot in the abdomen and captured alive by police and is in hospital after the attack on Tuesday that claimed eight lives and injured 11 others. Saipov rented a truck from a home depot in Passaic, New Jersey, before driving it into Manhattan, officials said. After the attack, investigators found a handwritten note from the rental truck in which Saipov had declared his allegiance to the Islamic State. 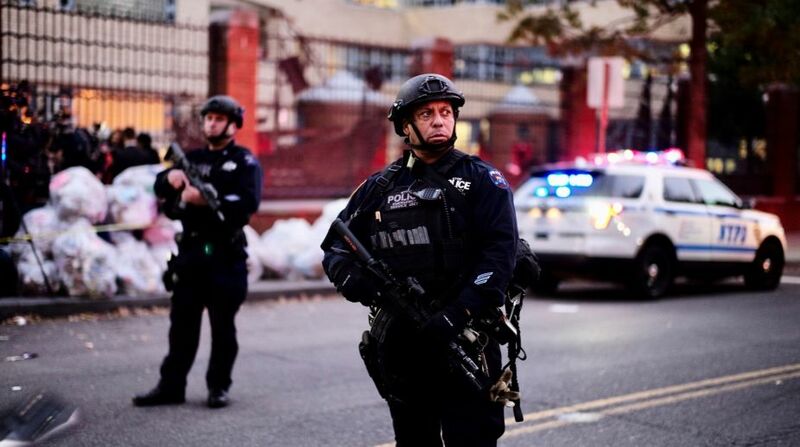 The attack unfolded as nearby schools were letting out on a Halloween afternoon. It ended five blocks north of the World Trade Centre. The driver left a roughly mile-long crime scene: A tree-lined bike path strewn with bodies, mangled bicycles and bicycle parts, from wheels twisted like pretzels to a dislodged seat. Saipov, a slim, bearded man, was seen in videos running through traffic after the attack with a paintball gun in one hand and a pellet gun in the other. Witnesses described hearing Saipov shouting “Allahu Akbar” or “God is great” in Arabic — as he carried out the attack. Dilfuza Iskhakova, who lived in Cincinnati, Ohio, told investigators that Saipov had stayed with her for several months about six years ago after arriving from Uzbekistan, the Times reported. Iskhakova said her family had lost contact with Saipov in recent years and she thought he had moved from Ohio to Florida, then to the New York region, and that he now had a wife and two young children. A marriage licence registered in Ohio listed Saipov marrying 19-year-old Nozima Odilova in 2013. Both gave Tashkent, Uzbekistan, as their birthplace. The couple gave the same address as the Cleveland headquarters Bright Auto LLC, and Saipov’s occupation is listed as truck driver. As investigators began to look into Saipov’s history, it became clear that he had been on the radar of federal authorities. Three officials said he had come to the federal authorities’ attention as a result of an unrelated investigation, but it was not clear whether that was because he was an associate or a family member of someone under scrutiny or because he himself had been the focus of an investigation. Kobiljon Matkarov, 37, an Uzbek immigrant told the New York Times he met Saipov in Florida several years ago when Saipov was working as a truck driver. “He was a very good person when I knew him,” he said. Authorities said it was unclear when Saipov moved to New Jersey and began driving for Uber, but it is understood he passed the company’s background check. In a statement, Uber said the company was “horrified by this senseless act of violence”. Saipov had been arrested in Missouri last year after he failed to appear in court on a traffic ticket issued in 2015. A Missouri court record states Saipov appeared in May and entered a guilty plea.